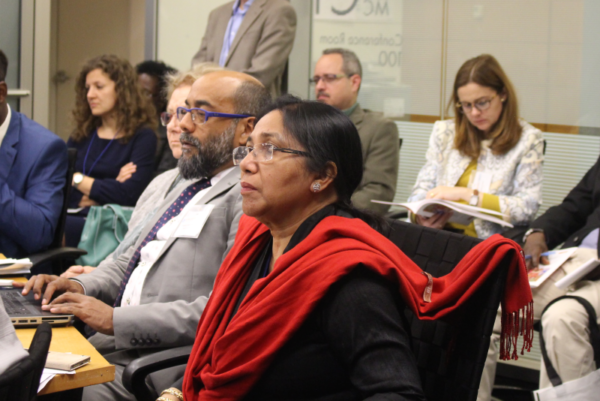 On May 19th, the Partnership for Transparency Fund (PTF) participated in a panel discussion on “New Frontiers in Citizen Engagement in World Bank Projects” at the annual GPSA Global Partners Forum, hosted by the World Bank. PTF Project Advisors Fred Temple and Vinay Bhargava joined Shahin Kauser, Technical Officer at Manusher Jonno Foundation, and Utpal Misra, Governance Specialist at the World Bank, to discuss future integration of citizen engagement and monitoring components in World Bank projects with over 60 forum participants. This discussion reviewed the lessons learned from the Citizen Action for Results, Transparency and Accountability (CARTA), a third party monitoring program aimed at improving public participation in World Bank project monitoring to enable communities to better communicate their needs to various levels of government and, in turn, improve public service delivery. Vinay Bhargava, PTF’s Chief Technical Officer, encouraged practitioners to include at least 1 of the 7 citizen engagement approaches in all World Bank projects, along with a monitoring mechanism. He explained that civic engagement program should be seen as business opportunities, as it solidifies their legitimacy and relevance in the community. CARTA is one of PTF’s key approaches to empower civil society to monitor public funding usage, especially in development agencies and donors. PTF intends to capitalize on the success of the CARTA approach, and will strive to expand the model to other regions and sectors. For more information, e-mail us at info@ptfund.org.